When Is It Too Late To Sleep Train? And that’s the question we’re tackling today, readers: When Is It Too Late to Sleep Train? Is It Ever Too Late To Sleep Train? Good news — the answer is no, it’s not! There’s no expiration date when it comes to sleep training. Remember, sleep training is simply the practice of teaching your baby to fall asleep on his own, without help from you. It’s helping your baby or toddler break her sleep associations. Remember too that for many parents, sleep training is a big step towards helping their baby or toddler build healthy sleep habits. And we can’t overemphasize the importance of healthy sleep habits! Chronic sleep deprivation in children can lead to obesity, learning issues, behavior problems, and even depression. And chronic sleep deprivation’s no picnic for adults, either — it can lead to a host of health issues and mental problems. So if your little one is a terrible sleeper, and you’re getting the sense that it’s time to tackle the problem, don’t worry that it’s too late. Even if you’re worried that you’ve missed the “ideal” sleep training window, don’t let that stop you. 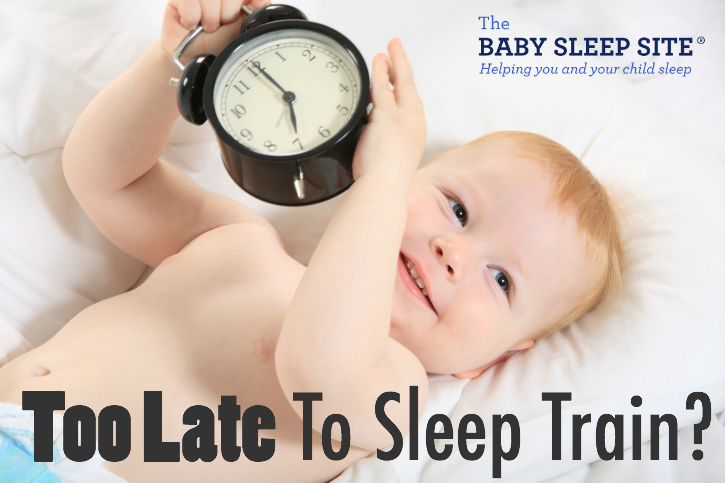 It’s never too late to help your baby or toddler learn to sleep soundly! An aside — often, when parents talk about sleep training, they’re talking about nighttime sleep training. That, after all, is the killer for most families — the endless, middle-of-the-night wakings. But, sleep training applies to naps as well. If your baby or toddler is sleeping relatively well at night but suffers from terrible (or maybe even non-existent) naps, you can utilize sleep training to make those naps more restful. Naps may be different than nighttime sleep, and may present more challenges, but babies and toddlers truly can learn to take good naps, just like they can learn to sleep through the night. It may never be “too late” to start sleep training, but that doesn’t mean that some times aren’t better than others for sleep training. We’ll discuss good times to sleep train in just a moment, but use this as your guiding principle in determining when to sleep train: the longer you wait, the harder sleep training (usually) is on everyone. That’s simply because deeply ingrained habits take longer to break, and the habit-breaking process is more difficult. Ask anyone who has tried to change their eating habits or quit smoking. Of course, every family is different, and not all babies (okay, few babies!) follow our nice, neat little plans. 😉 Remember, you know your baby best; if your situation simply demands that you delay sleep training for awhile, then so be it! That said, let’s look at some good (and some not-so-good) times for sleep training to happen. The 4-7 month window. This the best time to start for many families (although not all). Why? Because at this point, your baby is past the 4 month sleep regression, so she’s starting to develop more “adult” sleep patterns. Your baby is also much less mobile at this stage than she’ll be in a few more months, and that lack of mobility makes sleep training a bit easier. Finally, because your baby is still quite young at this point, any sleep associations she may have formed won’t have had time to turn into strong habits. That means they’ll be easier to change. For babies younger than this, our e-book, Essential Keys To Your Newborn’s Sleep outlines newborn-friendly sleep coaching strategies for your newborn, including sample sleep-inducing routines. We also offer special newborn-focused Personalized Sleep Plans™ that are crafted to guide your baby to better sleep in a gentle, safe way. The 11-16 month window. This isn’t as ideal a time to sleep train as the 4-7 month window, but if you skip that one, this is the next one to try. Why? Because your baby is past the sleep regression that happens at 8/9/10 months, and her sleep patterns should be back to normal. (Although if your baby has never been a great sleeper, her “normal” sleep patterns may be fairly crazy!) Remember, it’s best to sleep train when things are as normal as possible, so waiting until a sleep regression has passed can be a good idea. Before 4 months. We don’t recommend that parents start any formal sleep training before a baby is 4 months old. Why? Because before the 4 month mark, a baby has newborn sleep patterns, and it’s best to wait until your baby has developed more adult sleep patterns before you sleep train. It certainly doesn’t hurt to put your baby down for a nap awake if she lets you, but real sleep training needs to wait until your baby’s a bit older. For advice on how to get help your baby sleep well in those early, newborn months, check out this article on tips to help your newborn sleep. The 8-10 month window. There’s a sleep regression that can happen right around this time, and it can be a doozie. Between 8 and 10 months, a baby’s mobility is just exploding. They’re learning to crawl, learning to stand, learning to cruise…some are even walking! This new-found mobility is exciting, but it definitely can be disruptive for sleep. So if you haven’t done any sleep training before 8 months, it may be challenging to obtain “perfect” sleep, while your baby gets through this regression. That’s not to say you can’t sleep train during these few months, of course; it’s just that things might be a little tougher and you may need to have lower expectations about what “success” will look like. After 18 months. Let’s be clear — you CAN sleep train your toddler after he’s 18 months old. It’s definitely possible. Our many clients will testify to that! But sleep training a toddler who’s 18 months or older can be tough. Very tough in some cases. By 18 months, your toddler’s sleep associations have become strong, deeply ingrained habits that can be difficult to break. And as he gets closer to those Terrible Two’s, his will is getting stronger and stronger, too. That means you’ll have the added challenge of trying to make your persistent toddler do something he doesn’t want to do. No easy task! Ready to ‘Seize the Day’ and start working on your baby or toddler’s sleep problems? It’s not too late! You can connect with a sleep consultant today and start your journey to better sleep tonight. To start, browse our list of consultation packages and decide which one is the best fit for your unique situation. Click here to take a look at our consultation packages. Once you purchase, you will immediately receive access to the Helpdesk, and you can set up your account, fill out your Family Sleep History form, submit it to a consultant, and get started on the journey to better sleep! It’s that simple! When did you decide to sleep train and how did it go? Was it the “right” time? Hi! My son was a great sleeper from 4-12 months. Since then he is very difficult to lay down. If I do get him down in his crib and asleep, he wakes up a little later, screaming for me. Because I’m exhausted, I usually just end up with him in the bed with me. He also seems to be trying to push back his bedtime. He frequently doesn’t seem tired at 7:30 (his usual bedtime) even though he wakes from him nap at 2pm. Any tips on sleep training this (almost) 15 month old? If you need more help beyond the free guides, let us know as we have a wealth of in-depth information that can help you through this! To see more of our offerings please visit here: https://www.babysleepsite.com/baby-toddler-sleep-consulting-services/ or contact us directly at contact@babysleepsite.com anytime! I hope this helps! I plan on sleep training my 7 month old, and I’m hoping to start tomorrow (Friday night). He is in daycare so naps during the week are in a noisy environment without someone who can give him the same wind down process I do. Do you suggest I start with night time only, or include daycare in the training. How would I get them to train at daycare? @ tracie — no problem! I’ll keep my fingers crossed for you, too. Hopefully, it’ll go smoothly, although if it doesn’t, don’t be discouraged! You’re starting your sleep training early, which is (usually) a good thing. Thank you for the quick response. We will try with paci first for naps. I hope it works! Crossing fingers. Regarding the pacifier situation: hard to say for sure. My guess is that it would be fine to use it for one and not the other, especially since you’re sleep training quite young. Using the paci for naps but not at night would probably be confusing and counterproductive for a toddler, but for a 4 month old, it would probably be okay to switch back and forth. Thank you for this wonderful post and resourceful website. I go on here almost everyday to read as a new mom. I have a question: I am planning to train our LO at 4 months. We currently use a paci to put him to sleep for nighttime and naps. I want to train him first for nighttime then naps after. If I get rid of the paci for nightime training and use it for naps (because I think he will need the extra sleep during this nighttime training and i don’t him to stress too much from crying), will that confuse him if I give him the paci for naps to help him sleep? Please help. Thank you. @ Emuna — what an excellent point! I think this is a great observation — just because you’ve successfully sleep trained once doesn’t mean sleep is perfect forevermore. Every family experiences bumps in the road, and I know that for some, those bumps end up being more like small mountains. 😉 And those families do end up needing to re-train. Thanks again for pointing this out, Emuma, and for sharing your experience! This was a very informative post, thank you! If I can add my own 2 cents, I would say from personal experience that it’s possible you will have to utilize all of those sleep training windows! Just because you sleep trained at 4 months doesn’t mean that your baby won’t need re-training at 7 or 10 months. I have found that it always take a fair amount of work to get back on track after a regression, recovery from an illness, change in schedule, etc. etc. We went through a particularly rough time when our daughter was about 13 months with back-to-back pinworms, diarrhea, bad cold, and meanwhile was transitioning to one nap. It took close to 2 months to get her back to sleeping “normally”. Also when she was much younger we flew overseas, and when we got back we had a horrible time trying to get her to sleep well again. As an aside, some things I have found they DO just grow out of. There was one point where she was sleeping with a nursing pillow in her crib – she would snuggle up to it at night – it was so funny and cute at the same time. Eventually she just didn’t need it anymore. I guess every baby is different, like you say. I guess my main point is that it’s an ongoing thing with ups and downs and rights and lefts.